It would be hard to tell from the street that Urban Cowboy Public House, a watering hole in Nashville, even exists. It sits behind a Queen Anne Victorian property, a traditional front by all means, and yet that's part of its appeal. 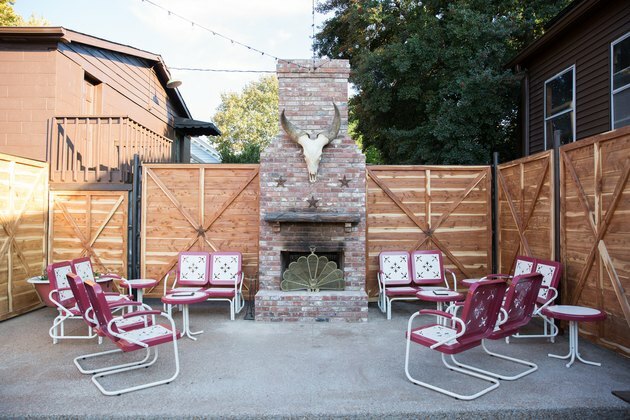 For those who are in the know — and hey, it could be guests of the house itself, which is home to the Urban Cowboy B&B — this outpost is a casual enclave, a place where country hallmarks mix with the kind of styles seen in a big city. That's what owners Lyon Porter and Jersey Banks were going for when they set out to create a neighborhood hang with a sharp sense of Southern hospitality, even though inspiration was pulled from their first venture in Brooklyn of the same name. 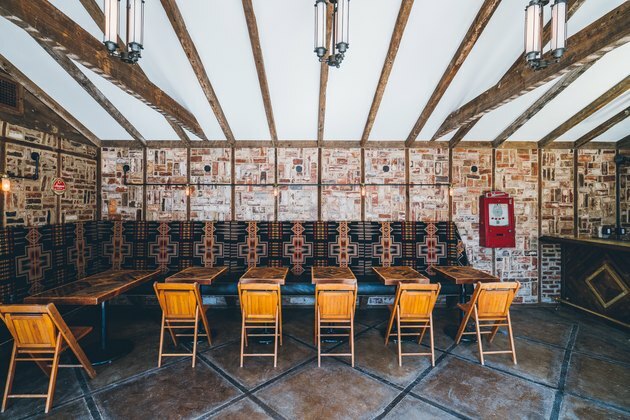 The duo paid homage to the borough by using glass garage doors, exposed brick, and wood interiors, but coupled them with locally-sourced antiques, vintage-inspired pieces, and custom-made furniture that's more in tune with down-home surroundings. It's the kind of design that would suit cowboys and city folk alike, thanks to elements that look too cool enough to care. Once upon a time, this space was a horse stable, a vintage clothing store, and even a Dairy Queen test kitchen. 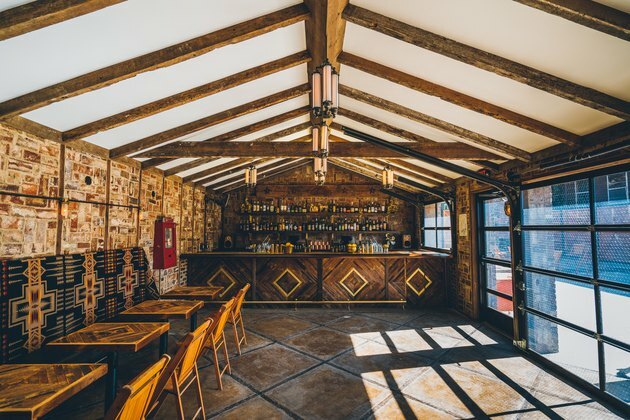 And now, the bar and kitchen is a gathering place for locals and tourists to mingle over drinks. Much of the wood in Public House came from M. Fine Lumber in Brooklyn. 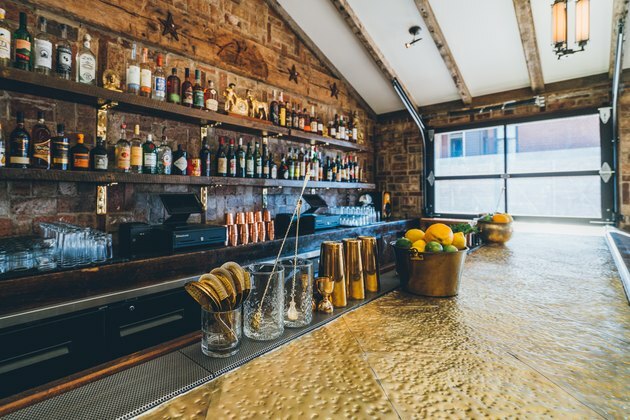 The custom-made brass top bar is the focal point of the room. The light fixtures came from old ships, and are made of nautical brass. Porter found the leather-topped bar stools at Olde Goode Things, an architectural antique store in Los Angeles. 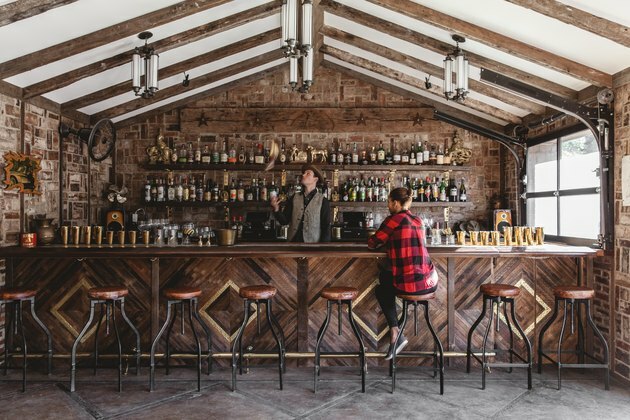 The star and eagle mantle over the bar's shelves is Porter's favorite design element in Public House — he begged its seller to give it to him for years. Right next to the bar is a set of glass garage doors, which is a nod to Brooklyn. When the doors are open, guests can move between the dining space and patio. Public Space visitors can grab a seat out at the banquette, which is draped in classic geometric Pendleton fabric. Porter found the wooden folding chairs, and the dining tables were custom-made by 1767, a creative group in Nashville. The antique cigarette dispenser makes for unconventional wall art. A sparse, casual patio is right off of the bar. At night, regulars will cozy up to the fireplace in red and white Metro metal chairs. Porter found the watusi cattle skull at Hail Dark Aesthetics in Nashville.